The every day experiences and encounters that might give the most thoughtful of people a few seconds of cerebral pause inspire Julien Labro to compose sophisticated melodies. “For example, I came up with one song while I was on the subway in New York City. I saw a little boy of about 1 or 2 sitting in his stroller. He looked so comfortable and chill. He was probably one of the coolest kids I’d ever seen. At that moment a tune came to me almost like a soundtrack for him,” Labro says, adding that he whistled the tune into his phone in order to record it once he got home. “It’s more about capturing a feeling or a moment. I’m never sure when or what will evoke a feeling or create a memory that I want to capture and share,” Labro says. “I was impressed by how well he could play and by how deep his voice is. I mean, have you heard him speak? All joking aside, he is a very talented guitarist,” Labro says. 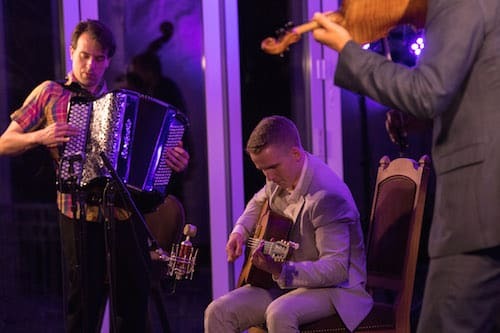 Both musicians began playing their instruments as young boys, both inspired by the music of Django Reinhardt and The Hot Club of France before branching off into a vast array of genres and touring Europe and then the world with a variety of jazz greats. To name just a few, both have shared the stage with Bucky Pizzarelli and Tommy Emmanuel. Soikkeli has toured with Paulus Schäfer and Cyrille Aimee and Labro has collaborated with Grammy winners Jason Vieaux and Fernando Otero. Don’t miss Julien Labro and Olli Soikkeli Quartet (featuring bassist Eduardo Belo and drummer Nick Anderson) at the 2018 Vail Jazz Winter Series at Ludwig’s Terrace in The Sonnenalp on Feb. 21. The evening features two 75-minute performances. Doors open at 5:30 and the first performance launches at 6 p.m. The second seating takes place at 8:30 p.m. (doors at 8 p.m.) Tickets to each performance are $40. Seating is jazz club style around small tables. Dinner service featuring favorites from the Bully Ranch and a full bar will be available. For tickets or more information, call 970-479-6146.